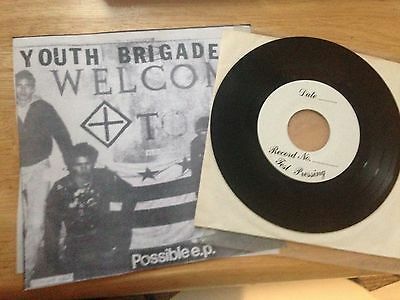 Here we have the Youth Brigade "possible" 7" test pressing on Dischord Records. Dischord no. 6.This is original, no bootleg, repress, etc….vinyl is excellent. Honestly, it's more like near mint but i'd ratherunder grade. There are no scratches. This comes with a copy of the front and back cover. Also comes with a copy of the insert (not pictured). The copy of the insert is not cut outlike the tomb stone. it'sjust a copy of the insert my friends. Please ask any questions you may have prior tobuying. There's a fair reserve on this monkey. Nothing unreasonable.